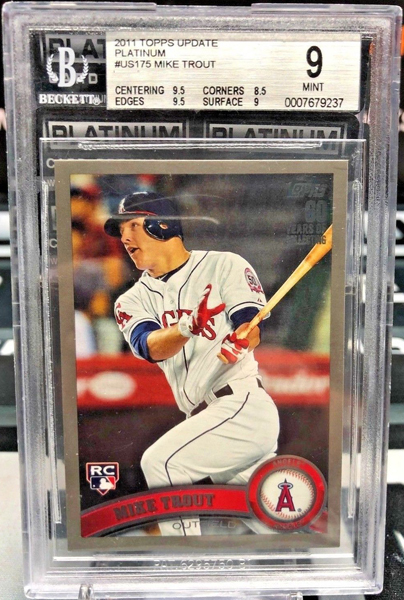 The Mike Trout 2011 Topps Update card has become a staple in a list of the hobby's most desired rookie cards. It's many parallels have proven to be some of the most elusive and expensive. In a past article, we featured likely the most extensive image selection of the different parallels of this card found anywhere online. This Platinum 1/1 was among the list. Well, it recently changed hands again and this time for big money. On 9/7/2018, an offer was accepted at $100,000. Since this is a 1/1 and given Mike Trout's numbers are most related to those compiled by Mickey Mantle, if he can stay healthy and continue to produce, this card has a chance at continuous appreciation.